Dabholkar’s reflections on Andhashraddha Nirmoolan Samiti’s and his own work . Dabholkar was requested to write about his past experience and achievements in the Deepavali issue of the Magazine called ‘Shabda’ (word) . About 8 eminent persons wrote about their experiences and achievement under the Title ‘A Look Back’. Here is the English translation of his article, written in Marathi, in this connection, in July 2007. The editor of a magazine asked me to write an article for a section titled “Looking back at the past”. It was also mentioned in the letter that some other renowned and extraordinary individuals were invited to write in this section. I did feel flattered by this sentence. It also suggested that I was expected to write on ‘what I am known for’. Every now and then, whenever I meet unfamiliar people, I come to know what I am known for. It’s true that for the last 20 years, I have been active in the movement for Eradication of Superstition. But it is also true that for the last 10 years, I am the editor of ‘Weekly Sadhana’ a weekly started by Saneguruji and I must mention that this weekly has been progressing in all respects since then. Even then if I come across 100 newly acquainted people, 95 out of them seem to equate Dabholkar and Eradication of Superstition. Most of them have not heard of ‘Sadhana’ and therefore Sadhana does not make any sense to them. In fact I have reached this stage of eminence and reputation not just by tracking a customary reliable road but by trying many untrodden paths too. For example, I was a national and international Kabbaddi player. There is only one book in Marathi giving a detailed and systematic account of Kabbaddi as a sport; and that book is written by me. I was honoured with the “Shivachatrapati Kreeda Puraskar” the highest award for Kabbaddi. I have enjoyed being on the Kabbaddi ground in various capacities as sports organizer, sports column writer and commentator for as many as 20 years. The same can be said about the weekly Sadhana. Along with Eradication of Superstition, I have founded a big institution for deaddiction, which has helped a number of addicts. But the editors, I feel, do not want me to ‘look back’ on any of these endeavours of mine. One reason, I can think of is that people from all walks of life, of all ages, rich and poor, educated and uneducated, men and women, all have a certain inquisitive interest regarding faith and superstition. ANiS (movement for Eradication of Superstition), I believe, stirs this interest and links up with them. The feudalist psyche still lingers among the people of our country. People admire and respect the individual more than his organization; and therefore have equated Narendra Dabholkar with Eradication of Superstition. That seems to be the reason why I am invited to write about my past experience. Conviction and continuity are two aspects that distinguish individuals like us from the crowd; so does the editor believe. She goes a step further and elaborates, ‘conviction means not just intellectual clarity; it should, move the heart along with the intellect and create a moral thrust compelling action. I must admit that no such thing has happened in my case. I did my M.B.B.S. and started medical practice and social work- a small organization, ‘Samajvadi Yuvak Dal’- along with it with the help of some likeminded friends. Many such small groups called action groups mushroomed in Maharashtra during the 70s and 80s. They mushroomed, glittered for a while and disappeared. So did our Samajavadi Yuvak Dal. It started in 1971 and breathed its last in 1982. We would not like to call this extinction. So we decided to merge with the movement, ‘Samata Andolan’. In about two years this endeavour too came to a halt. This was the time when the work of Eradication of Superstition began. It was B. Premanand’s crusade for promotion of science all over Maharashtra that set it off. B.Premanand led one group in the larger crusade ‘Vidnyan Yatra’ planned by many organizations for promotion of science. Miracles that the self styled godmen perform and we now regularly duplicate in all villages, were first demonstrated by B.Premanand. Huge crowds gathered to see them. I sensed that this kind of work can take root in Maharashtra and prove quite useful. But it did not occur to me that I was the one who should take the initiative. Rashtra Seva Dal was a prominent group in the organizing committee of the science promotion expedition. I requested the head of the committee to take up this work. They did not consider it of much importance. In those days I was not occupied as I had given up my medical practice and my organization too had come to an end. People are on the lookout for such unoccupied individuals and recruit them immediately. However, I did not come across anyone who would utilize me. So putting the work and the free time together, I started it of my own accord. There wasn’t any incident that could have jolted me into this work as people imagine. In fact of my friends did not approve of my way as an activist. Some of them don’t approve it even now. They think I am wasting my time in demonstrating miracles. So this is all about my convictions. The second point made by the editor, viz, continuity applies to me pretty well. But again this continuity has not been caused by any dedication to the work on my part. Continuity seems to be my stable attitude since my childhood. While in school, I was a member of the Kreeda Mandal. I used to religiously visit Kreeda Mandal every evening, all 365 days of the year. I used to sprinkle water on the ground and carry out all similar menial jobs there. During these days I did not even once loitered on the streets of Satara or go to a 6 o’clock cinema show. Again when I was selected to be the editor of Sadhana, ANiS movement was running in full speed. So those who entrusted Sadhana to me were somewhat apprehensive of whether I will be able to dispatch the issue every Tuesday for printing, get the binding of printed issue done on Wednesday, and post all the copies on Thursday before 12 noon, week after week without fail. A break in this practice amounted to inviting a disaster. Would it be possible considering my tight schedule of crisscrossing rural and urban Maharashtra? But this is a story of the past. It is now ten years in which period 500 issues of Sadhana have been released without breaching any of the above routine. The editor also suggested that I should look back on my writing and speak about cautiousness, anxiety, pride, amusement in the past that is expressed in it. Now, it is natural to harbour some pride in mind; but no anxiety and not a trace of pondering over the past. It’s simply not my nature. Many awards have come my way and a few of them are very precious- for example, I was given the ‘Best Activist of the Decade’ award with a prize money of Rs.10 lakhs by the Maharashtra Foundation of America, last year. But not a single award, including this one is preserved in my home. I don’t possess that kind of mind that muses over the past. Cautiousness, however, I do possess. You may call it restraint or temperance. I never adopted a do or die stance on the playground or in my social work. So in my case, earlier conjectures that all the surrounding systems falling flat or proving wrong did not occur. May be, I never undertake any big deals or put all at stake. So I never lose everything. I do not believe in tough belligerent action, which is not my nature. I believe in perseverance and adopting pure and clean means to achieve the goals and that is my method of work. I had no experience of having been insulted, deeply enough to touch the core of my heart. I don’t believe anybody can do that to me. At times I might have felt a little upset, sad or disappointed by the behaviour of someone facing me; but I never felt insulted nor was I scared because of the threats heaped on me. Narendra Maharaj has instigated people in his public speeches to sever my limbs from my body; accused me of accepting bribe from Christian Missionaries for destroying the Hindu religion. The Shivasena and BJP MLAs have demanded banning of ANiS and my expulsion from Maharashtra state in the legislative assembly. Whenever news papers or channels asked me for my reaction to it, I would only say, ‘oh god of their faith, forgive them, for they do not understand what they are speaking.’ I fasted for ten days so that the anti black magic bill be passed. What was expected did not happen. When caught in such an impasse, many are perplexed. Who will take the initiative to end the fast and how? Who should speak vehemently at that occasion, etc. But I did not need any of these gimmicks. It was me who started the fast; so it was up to me alone to end it and so I ended it. That is all. Many people asked me, ‘Aren’t you frustrated that for no reason the bill is being postponed for the last 16 years?’ Of course I am disappointed at this delay; but at the same time I am well aware of its limitations and the precincts within which we can put it to use. So neither was I hurt to the core by this inexcusable delay; nor could I be provoked into some strong reaction to win. In the field where I am engaged one has to measure the success of his work not in terms of decades but in terms of centuries. Thus there were no insults; the honours and tributes, I honestly think, were more than what I really deserve. I know that any decision taken hastily in an inattentive moment can cause a lot of damage, especially in such a sensitive field where I work. So far I have been able to avoid blunders. But it can happen any time because of the sensitivity of the field of work and the shrewdness of my opponents. Just one example: “In Shanishinganaapur the houses do not have doors and miraculously no robbery occurs there. Since you don’t believe in miracles what can you say about this?”, asked one news paper representative. I said, “robbing (in that place) will be our responsibility and punishment is that of god; neither the police nor the residents should be allowed to interfere. Under these conditions this phenomenon can be tested.” Actually this was a purely confidential response to his question given in jest. But the news agent got it printed with a sneaky title, Dabholkar says, he is going to lead a movement, ‘let us go to Shanishinganapur and steal.’ The whole of Nagar district was agog and we had to suffer the consequence. I am now 62 years old, but I have yet not experienced fatigue. Our movement is not really robust enough, at times the feeling of hopelessness lurks in the mind. The ups and downs, anger and kindness seen in all movements, occur in our movement too. But I have never experienced the utter exhaustion that the editor was talking about. In short both enchantment and later on its disenchantment have remained away from me. I have no experience of insults, blunders, fatigue, confusion, etc. and on the contrary received honour and recognition much beyond what I really deserve. The editor also asked me, “When you feel utterly tired who do you think of and who revives your energy and strengthens your resolve to march forward?” There is no question of tiredness in my case as I said earlier. However my own limitations are becoming more and more obvious. I can’t see any way of widening and increasing the scope of my mission remaining true to it at the same time. Nor do I see anybody who can guide me. The only exception is Mahatma Gandhi. This great man has beckoned me time and again. But my study of Gandhian ways is practically nil. Despite this I feel assured that his thoughts and deeds will help me break out of this deadlock. This old man seemingly so simple and easy is actually very difficult to comprehend; adopting his ways is still more difficult. The moderate man in me is simply incapable of giving up all that I have achieved so far and mustering the courage to follow the path led by him. So be it. However as the editor wants me to look back at this stage. Hence I put my pen to paper here. Whether I have been able to do justice to the topic is left to the readers to decide. Eradication of Superstition is not a new thought for the people of Maharashtra. It stands on the firm foundation laid down by our social reformers. But the awakening that occurred then ceased after independence. The magazine Kirloskar had conducted a very successful movement during 1935 to 1945, against Buvabaji and on the other hand against false notions regarding god and religion. Dr. Babasaheb Ambedkar was thoroughly examining the contents of the Hindu religion. Sant Gadage Baba held discourses with the masses on reform in thinking- an important constituent of which was superstition. All this practically came to a halt by 1956. There was also another thought that superstition will be automatically eradicated as education becomes available spreading science and modernization in free India. The thought opposite to this was gaining strength gradually and in the 70s and 80s the sale of the magazine ‘Shri’ rose to lakhs and above. This magazine showed so called real photos of ghosts, and the jewel Chintamani that gave a bit of gold every day. Many such unbelievable stories were published and became interesting topics of discussions. In such an atmosphere, B.Premanand, a rationalist from Kerala toured the length and breadth of Maharashtra. He held many demonstrations in which he inserted a trident through his tongue; ignited fire by chanting Mantras, captured a ghost into a pot, obtained a golden chain waving his hand in the thin air, etc. Even today, people are smitten by miracles. Here it should be noted that demonstration of the miracles is not the same as magic shows. A magician brings all his gadgets and instruments and presents his tricks. A Baba does not bring things with him but gets them from his hosts. He takes some red Kumkum powder from the household he visits and turns it into black powder called Bukka or yellow turmeric powder. The magician presents his art; the godman demonstrates his supernatural powers. People’s fondness for miracles help in building an organization. However ANiS has always taken precaution to keep miracles away from the work of eradication of Superstition. Performing miracles was and still is a strong point for Samiti but superstition of all kinds is the main subject of study and work for ANiS. Samiti has unravelled many puzzles like automatic movements by objects, clothes getting torn or catching fire spontaneously, signs of marking nut appearing on the body, etc. ; examined the phenomena of possession by a deity or ghost and provide psychological explanation of what these things are and why do they occur. Samiti also proved that astrology is not a science when scientific criteria are applied. It exposed different forms of Buvabaji and provided a sociological appraisal of it. People are extremely eager to know all about such occurrences happen. This helped the Samiti to make a place for itself in their hearts. Samiti, at its own risk, critically examines faith and superstition. One man’s faith appears to be a superstition to another man and what seems to be a sheer superstition to the third one, happens to be the firm unfaltering faith of the fourth man. It is not at all easy to keep a public discourse alive in such matters. Such churning of thoughts is now possible in Samiti’s activities. Faith is inevitably related to religious faith in the first place. So eradication of superstition is made to look like eradication of religious faith and a battle against god and religion. It is argued that ”if god and religion are scrutinized, morality supported by religion will collapse and so will the society that has lost the support of morality. So beware of eradication of superstition for it is in fact eradication of morality”. We have adequately dealt with this constant propaganda against us and have dug our heels in. Every Indian citizen is bound to adopt Scientific Outlook as is stipulated in our constitution. It is an important value in education. However not only the common man but even those who work in the field of education have no clear idea as to what is Scientific Outlook. Samiti has undertaken the work of explaining scientific outlook to the people in the language they understand and propagating it among them. It is enough work for any organization to deal with issues like different types of superstition, the psychology that produces them, faith and superstition, scrutinizing god-religion-morality and propagation of scientific outlook. But the coherent thought emerging out of it, logically leads further to rationalism, secularism, eradication of caste system and social justice. Samiti has already moved forward in this direction. In short the process that started with the fascination for miracles has now reached up to all boundaries of all-embracing and far-reaching social change. I am not aware if any Indian organization engaged in this kind of work has made so much progress as ANiS did. The strength of our work lies not in its thinking and philosophical stand but in its day to day activities and the various innovative plans and programmes it organizes. The programmes in the list that follows are of course carried out by all workers together; but I participate in all of them personally and carefully watch them. Samiti has systematically devised a method of detecting the incidents of Bhanamati, discovering its origin and causes, giving psychological support to the person who causes it and finally putting an end to the fearful occurrences. Samiti has successfully tackled and stopped 250 incidents of Bhanamati without a single failure. In hundreds of confrontations against the godmen our activists have put their lives at stake and made the godmen wind up their business. The Dakin custom prevailing in the Adivasi areas -where an unlucky woman is accused of causing all the ills that occur in the village and branded Dakin, is harassed and at times killed- is caused by superstition and vested interests. Samiti began a movement against this evil, three years back, in Nandurbar District. At that time people’s movements, NGOs working in that area, administration all were convinced that the Dakin Custom is so deeply rooted in the minds of the Adivasis that confronting it will provoke their wrath. Samiti did not deter from its goal and initiated a movement against this cruel custom. It has reached a stage where it can confidently spread this movement to ten other Adivasi areas in Maharashtra. The challenge to miracle mongering godmen to perform miracle under scientific conditions, initially was one lak rupees. This amount is steadily increasing. The prize money of ten lak rupees that I received last year for “Best Activist of the Decade” is added to this fund. The sum now stands at 21 laks. Along with direct confrontations, Samiti undertakes many other movements so that people can mentally prepared to accept change. I fully and wholeheartedly participated in all such movements. One movement ”Shodh bhutaacha, Bodh manacha” (searching for the ghost, enlightening the mind) was conducted in the Konkan area. Four groups performed, in all 167 programmes and we reached 3lak people through them. Another movement was ”Chamatkaar Satyashodhan Yatra” challenging all godmen to perform miracle under scientific conditions. The Yatra (pilgrimage) covered whole of Maharashtra twice. In Goa, Belgaon, and Konkan area ”Sarpa Yatra” was conducted to educate people regarding snakes and first aid for snakebites and to remove their superstitions regarding snakes. The Bhanamati in Marathwada is of a different type. There the afflicted women huff and puff and bark like dogs. At times many women together start huffing and puffing and barking. In the unbearably hot month of May, we literally combed whole of Marathwada in 8 groups performing 250 programmes to attack this menace of Bhanamati. We could not put a full stop to it but the number of incidents has reduced greatly. The ”Vaidnyaanik Janiva Prakalpa” is meant to educate teachers in eradication of superstition. Workshops are held to train teachers in a regular curriculum to be taught to their students. Teachers teach the content to the students and give them a test. About 10,000 teachers and 3,00,000 students have benefitted from this project. Samiti has assembled ‘Vidnyaan Bodh Vahini’ (science education on wheels) which is equipped with all that is required for science education. Where ever this van reaches, it becomes a festival time for students. This programme has been quite successful in Adivasi Ashram schools. Samiti has conducted many conferences, at various places in Maharashtra. Samiti wants that the government give up its pro liqueur producer policy and adopt a policy of total deaddiction in its place. Our second demand is that the test for HIV positive/negative be made mandatory before marriage. The appeal for these demands, signed by 100,000 people was presented to the then chief minister, Sushilkumar Shinde, all in vain as expected. Samiti is spread in 180 branches all over Maharashtra. Since or programmes intended to awaken people always have a silver line of entertainment, so they are much in demand. As every branch organizes about 10-12 programmes every year the total number reaches 2000. ANiS’ line of reasoning requires a proper grip on the subject with sound and coherent argument. If your fluent oratory and honest concern reaches hearts of the people it becomes very effective. I have myself benefitted a lot from all these boons. In the last 20 years, I must have given thousands of lectures. On many such occasions the lecture is followed by a question-answer session. 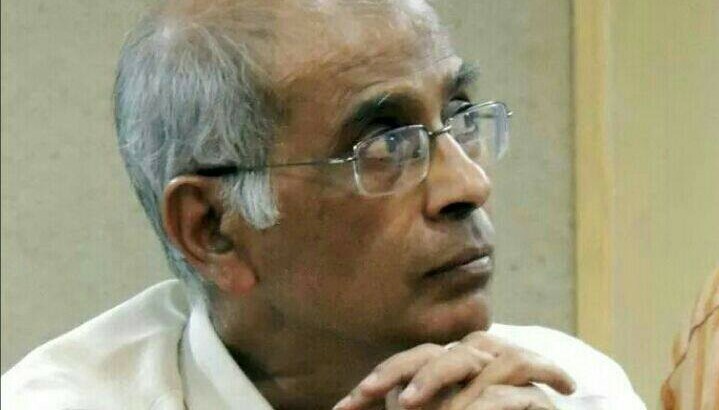 More often the questions are intended more to expose Dabholkar than to satisfy curiosity. They try to trap me. But so far they have not succeeded. So far there has not been even a single occasion when I was not able to answer a question relevant to the subject at hand and they could not trap me. I had to answer many crooked questions asked on different channels in various programmes and many people feel that I have given them fitting answers. The programmes of open tête-à-tête between Dr. Lagu and myself became especially popular. The stand Dr. Lagu adopted was that God is the initial superstition that spawns the whole lot of other superstitions. So unless you strike at god eradicating superstitions is not possible. I too am an atheist but my stand is not so hard hitting like that of Dr. Lagu. And the Samiti believes that it is not necessary to be an atheist in order to participate in the work of eradicating superstition. Samiti is neutral as far as god and religion are concerned. Dr. Lagu calls it escapism. I feel that Samiti’s stand is in consonance with the secularist stand adopted in our constitution. 100 such programmes of conversations between myself and Dr. Lagu stimulated ability of reasoning in many listeners. The Maharashtra Vidhan Sabha have passed bill against Black Magic. Yet it has not become a law. Vested interests are busy opposing it for one reason or another and in misleading people through their vicious propaganda. These people have approached the government and requested them to ban me from speaking on the law. Samiti wants that animal sacrifice in front of deities in public view be banned. To stop this senseless killing of animals Samiti organized over 150 Satyagrahas at various places. To grant entry to women at the Shani Shinganapur Devasthan I participated in the Yatra and Satyagraha and was imprisoned for it with many of my colleagues. Each year in Maharashtra, at least one crore families install a Ganesh idol in their houses. These idols made of plaster of Paris and painted with poisonous chemical colours are immersed in flowing water, and start a chain of environmental destruction. To avoid it Samiti accepts Ganesh Idols that are ceremoniously taken to the place of immersion and immerses them at some convenient water source. In the first two years of the movement Samiti collected 40,000 idols but in the last two years, the Hindu Janajagaran Samiti vehemently opposed us. But since the intervention by government to stop immersion in flowing rivers to save environment, things are improving again. Yet we cannot avoid court cases already launched against us. In one demonstration against Nirmala Mata, famous for her Sahaj Yog, devotees of Nirmala Mata actually beat us and launched a criminal case against us. I published one article against this in one of my books. She launched a defamation case against me in the Delhi High Court. The story goes on and on. I am aware that this is not the place to present the whole Balance Sheet of Samiti’s work. But looking back gives us satisfaction that we could do so much in such adverse atmosphere and rightly feel proud of ourselves. This work of eradication of superstition started in 1985. But at that point of time it was not a proper organization. Some like minded persons carried out the work which was dispersed at various places in a lose network. In 3-4 years it became impossible for them to carry on. Though I was not connected with these groups at that time, since 1971, I have been involved in the various movements of Social Change, fighting for Social Justice, economic exploitation, corruption and politics. I came in this movement of eradication of superstition in 1985. I had not felt the need and urgency of it at that time. So as soon as bickering began to come to the fore, I decided to quit. I don’t know what would have happened had I quit the organization. But certainly I would not have been there. My Pune colleagues argued, ‘We have the intension to work, and you are the one who possesses a commanding oratory and also can spare time.’ Thus I became the Co-ordinator for two years and would continue if the organization seemed to take root. This took place in 1989. Two years later I was elected the working president. Strangely enough those who put pressure on me to lead gave up the work, one by one while I alone stuck on. We had 17/18 branches then; and now have a network of a large number of activists working in 180 branches. Recently an eminent elder social worker said to me, ‘you seem to be doing well; no bickering in the organization; although not an NGO, you face no financial difficulties; the media too support you.’ Though I was amused by his remark, I began to ponder ‘being such a huge organization, why is there no bickering, no quarrels, no disparaging remarks, and no antagonism?’ With this reassuring atmosphere, the love of the co-workers, their confidence in me, I am certainly in an enviable position. I have been the president from day one. After 3 years I wanted to step down but could not. Then they decided to allow me to step down once the anti-black magic bill was passed. It is being postponed time and again and I remain the president. Not that I will retire after stepping down, for I am blessed with some rare abilities, such as, organizing work, keeping cool, perseverance, enviable health and ability to travel and work continuously without rest. Of course, age counts and the picture will eventually change. But I will try my best to remain alert and active. We get considerable publicity and people think we hanker for it. But I always remind my co-activists that an organization can rarely remain in the public eye for such a long time; and we should be prepared for being ignored eventually. Our work is publicized for three reasons. First the activities for eradication of superstition are intrinsically newsworthy. Secondly people and the media in Maharashtra believe that our activists are honest. The third reason, I must admit is that we maintain proper relations with the media, take care to give them correct and honest accounts of our activities in time. Whenever any incident connected with Eradication of Superstition occurs I write a report on it and most of the main news papers immediately publish it. The real test me and my organization had to pass was altogether a different issue. Whenever an organization is founded people start casting aspersion s on it. To which caste do the activists and the leaders belong? As we gathered strength, the discussion about the castes became more aggressive. Some accused me of trying to destroy religion and therefore they asked for my expulsion out of Maharashtra. Others who called themselves progressive and secular accused that being a Brahmin, my real intension is not eradicating superstition and I am not capable of it. I have a hidden agenda, a Brahmanic plot for deceiving the public. This caste ridden psyche is illogical but it is made to sound logical. A venomous attack of this sort could harm any organization. But we remained unscathed not because all the exploitative characteristics stuck on to my caste do not apply to me; but because of the inclusiveness of the organization depicted in the vast membership encompassing all castes and sub castes existing in this state. Caste was never considered while electing office-bearers, so that sticking any caste label to the organization is impossible and does not work. I have no precise answers to the questions, ‘how could we spread the organization so wide, without any bickering? How can we get unstinted support from the media? How do we manage with such meagre finances? How do we remain aloof from the caste ridden psyche prevailing here?’ But I can mention a few possible reasons. Our organizational structure, setup and working are genuinely and intentionally democratic and decentralized. Another reason, more important than anything else, is that the volunteers join our organization because of their intrinsic motivation; they feel suffocated in the superstition ridden surroundings and do not know how to face it. They find a true enlightened path in Samiti’s work. So strengthening the organization and spreading it becomes their internal need. They strive to protect the organization from petty quarrels, caste biases and penury. Since the inception of the Samiti, I have been the working president and am considered the other side of the ANiS’ coin. But I am completely ignorant of how the Andhashraddhaa Nirmoolan Samiti became so strong, healthy and widespread. I did not play any particular role in this. So many people have helped me of their own accord. It won’t be proper to disclose their identity. Many advocates have come to my help, free of charge, whenever law suits are launched against me in various courts. The eminent actors Dr. Shriram Lagu and Nilubhau Phule consider themselves as our Bandhuva Majdoors, for we can count on them, whenever we need their help and extract work without remuneration. My wife, my brothers and sisters, my children all offer unstinted help to me. In treading this path, I avoid reacting to criticism, and refrain from entering the clamour of accusations and counter accusations of the blame game. I also refrain from taking legal action for defamation against anybody. I do not want to embroil the organization with lawsuits. I do not know whether I am right but one thing is sure that avoiding to react never puts you to any loss. When one builds up his image in people’s minds through such a long march he becomes immune to petty accusations. We have raised a new issue regarding the content of secularism. That is somewhat different from the prevailing progressive concept. One view says that the administration ought to put secularism in practice. The other concept maintains that secular politics is impossible as long as the economy remains unstable. So measures to stabilize economy should be given priority, informing the toiling masses during the process. I prefer to put it as: the umbilical cord of secularism reaches right up to the thoughts of Mahatma Phule, Viththal Ramaji Shinde, Mahatma Gandhi and Dr. Babasaaheb AMbedakar; all these social reformers made the anti-public religion turn and face the public. This will enrich the content of Indian secularism. Eradicating Superstition is not isolated work. It is necessary to unite it with the larger comprehensive social reform movement. But the links between these two movements are not in place as yet and we seem to work in isolation. So we should strive to avoid single track mindedness amongst the workers. The activists of the Samiti are constantly under public watch, much more than other organizations. How they behave? Do they walk their talk? But very few people can follow it. But we, ANiS as an organization and myself as an individual are honestly trying our best because the moral fibre of our character is our strength and people seem to believe in us. Many individuals agree with our principles and policy; but they do not join us because putting those principles into practice requires a lot more courage than they can muster. They cannot afford to antagonize their family and relatives. The poojas to be performed and vows to be fulfilled require both husband and wife to carry them out together. Refusal to cooperate will disturb the peace in the family. Gopal Ganesh Agarkar put his principle very succinctly as, ‘Mere adding to your erudition is not enough; one must have the courage to act accordingly.’ Next he adds, ‘I will tell whatever is right (whatever needs to be told) and do all that I can.’ I imagine this chain of social change as, ‘thought as the first step- then articulation of it- its propagation -and then putting into practice. The next step would comprise of building a union that amounts to practicing the principles collectively and finally confrontation to bring about change where the Samiti needs a change. Sowing seeds of reason in the mind is not an easy job. However reason uttered repeatedly does take you a step ahead. The utterance converts into a movement. If people involved in the movement practice what they propagate, the movement culminates into a union which is a good thing to happen. If, in addition the union jumps into a struggle for change, nothing like it. But climbing up these steps exhausts you considerably. I am treading this path with whatever ability I possess, knowing fully well that it is endless.